Cycle Europe is excited to announce a growing fleet of e-bikes. After watching the trends and developments in technology over the past few years we are excited to announce our fleet of bikes, mostly made up of Kalkhoff and Cannondale. These bikes feature state of the art technology and are a fantastic option for bicycle travelers who need a little push. Are you afraid of that steep hill? You think the mileage is too much for you? Although you still have to pedal the E-bike drive provides a nice boost for your efforts.Pedal assist e-bikes give you a constant nudge on your ride and conform to you pedal cadence and torque – up to 25km per hours, they are a solid help on the climbs and they increase your average speed! For example when your pedal stroke increases to get up a hill so does the amount of power the electric motor outputs. Less effort on your part translates to less power assist. These bikes come with rapid-fire shifters that operate in the same way as a regular hybrid bike. 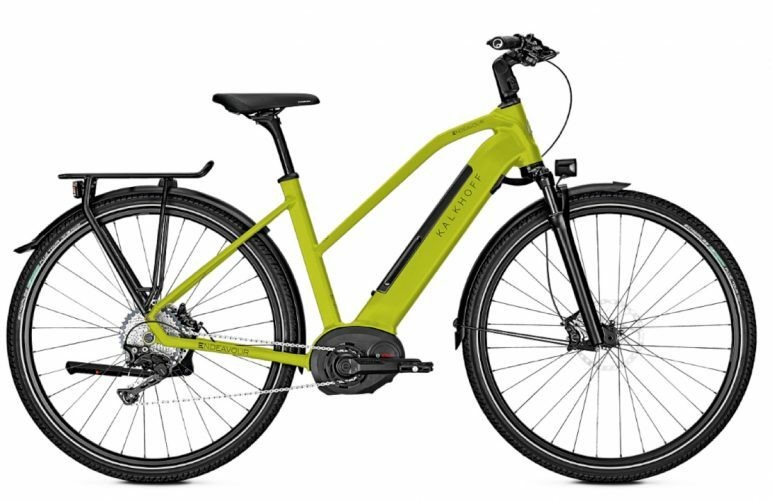 They feature an 11-speed drive train with gear ratios that are very similar to what you’d find on a mountain bike, which means you have a great range for climbing. These bikes are much heavier than a regular bike so they handle differently. Bikes come with 700×40 Schwalbe Energizer Pro tires that are made specifically for e-bikes. The tires feature an anti-puncture layer, good grip, and minimal rolling resistance. The e-bike drive automatically switches off if speeds exceed 25km/h (15 mph). Though the bikes are very quiet the electric engine does produce a light but constant noise. The bikes can be ridden without assist though as mentioned above they are much heavier than a regular bike. Operating range depends on many factors such as the assistance level, gear switching behavior, route profile, head wind, temperatures but in general the average range of our battery packs is 110km (68 miles). Riding an e-bike is easy and we will offer you instructions at the bike fitting! We have a limited number available but send us an email if you want to venture out on an e-bike.